Immigrating to North America around the turn of the 20th century to become a golf professional, David Black was the PGA of Canada’s second Captain, holding the position from 1914-1919. Black captured the PGA Championship of Canada four times, winning in 1913, 1919, 1920 and 1921. In 1911 he finished second at the Canadian Open to fellow PGA of Canada founding member Charles Murray. 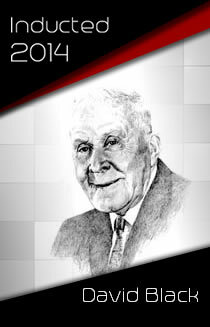 He was inducted into the Canadian Golf Hall of Fame in 1972.